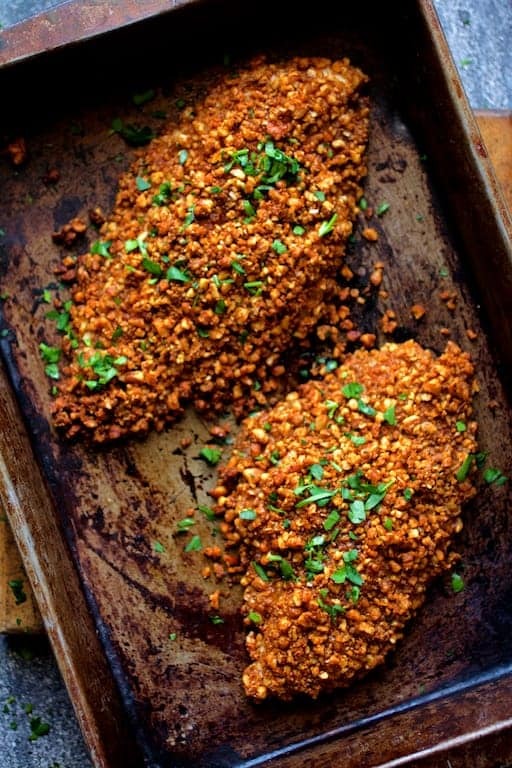 Baked Catfish Pecan Meuniere is my healthy interpretation of the Palace Cafe classic. Spicy Sauteed Greens make the perfect side dish! Servin’ up catfish N’Awlins style! Ever have one of those meals where you wake up the next morning thinking about the amazing meal you had the night before? Not long after my husband and I were married, we drove down to New Orleans for a long weekend. After checking into our quaint, boutique hotel that my genius husband found for half the normal price, we went for a stroll in the French Quarter. We were getting hungry after the long drive from Memphis so we decided the first place that looked interesting, we’d try and get a table. That place happened to be the famous Palace Cafe and I thoroughly enjoyed their Catfish Pecan Meuniere, a signature dish of theirs. Every. Last. Beautiful bite. 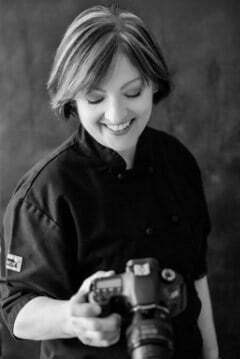 I enjoyed this dish so much that I purchased their cookbook so I could make it at home. However, when I saw the amount of butter and cream in their recipe, I freaked a little bit and decided to come up with a healthier version. 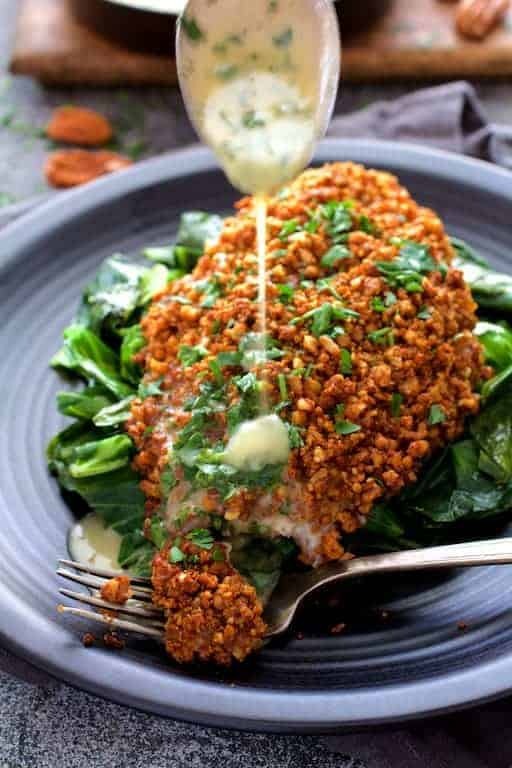 This version of their dish is one of our favorite fish dishes to make at home and it’s deliciously easy! Meunière, French for “miller’s wife,” refers to both a sauce and method of preparation mainly for fish. 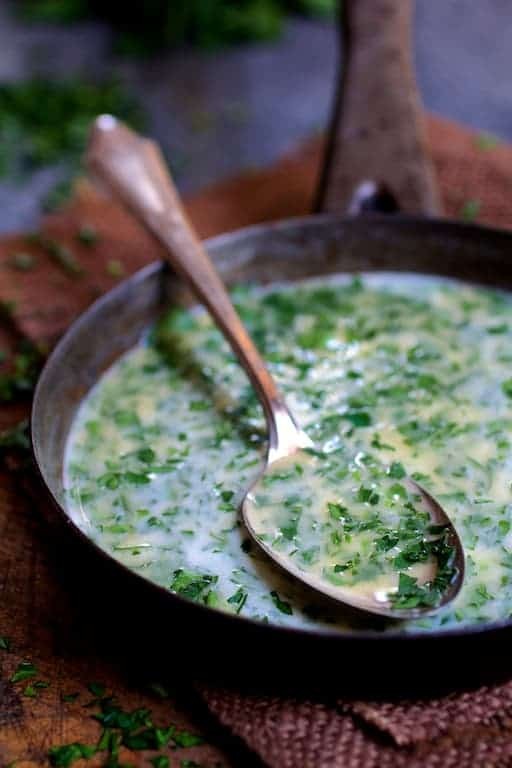 The sauce is often just browned butter, lemon juice and chopped parsley. 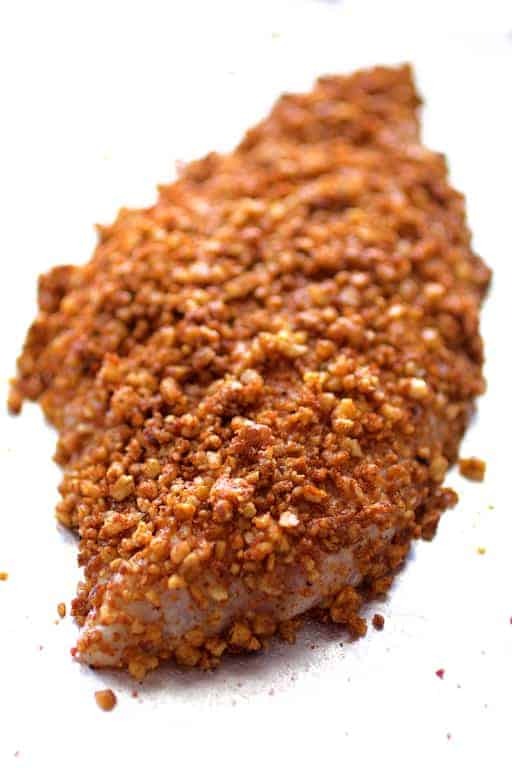 For meunière as a preparation, you would dredge the fish in seasoned flour and pan-fry, usually in butter. The Palace Cafe dresses theirs up with pecans and it’s a lovely addition! 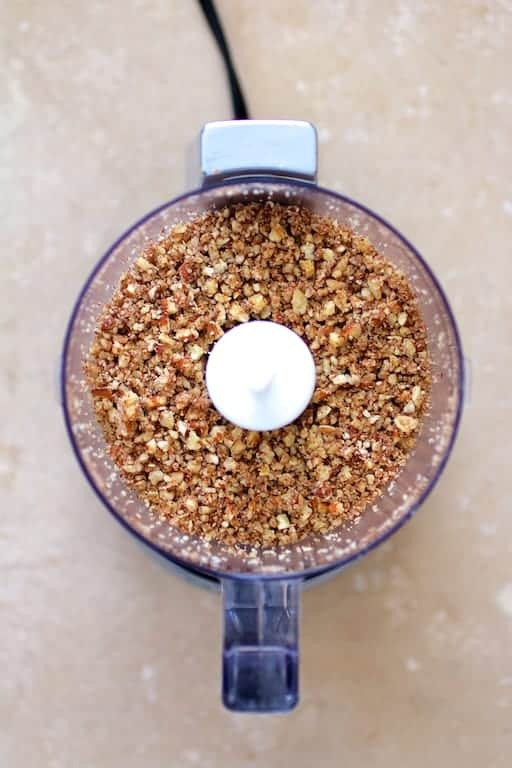 However, I have a “thing” about frying nuts because they can go from zero to burned in very little time. So, to make it healthier and avoid burned nuts, I just bake it. Farm-raised catfish is one of the few farm-raised fish I will eat as long as it’s raised in the U.S. In fact, the Monterey Bay Seafood Watch program considers domestically-farmed catfish to be a “best choice. Wild-caught catfish tastes a bit too “earthy” for my palate. Do your research and ask the fishmonger where the fish is raised. 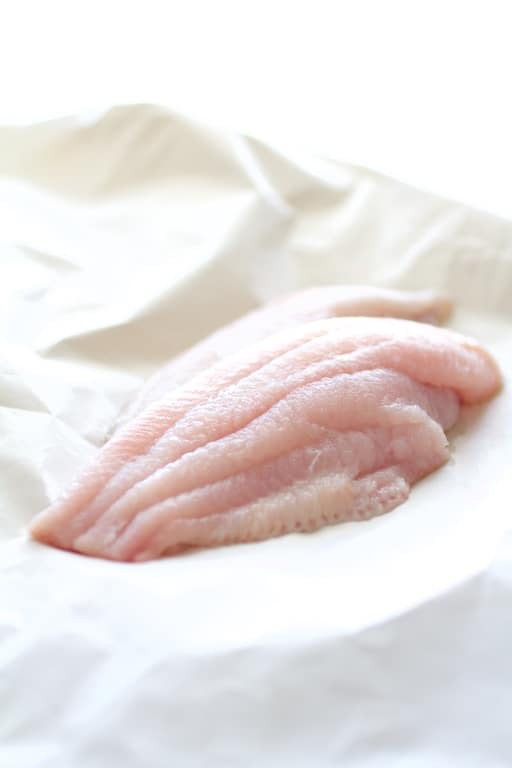 If you’re not a catfish fan, substitute any flaky white fish such as sole or flounder. 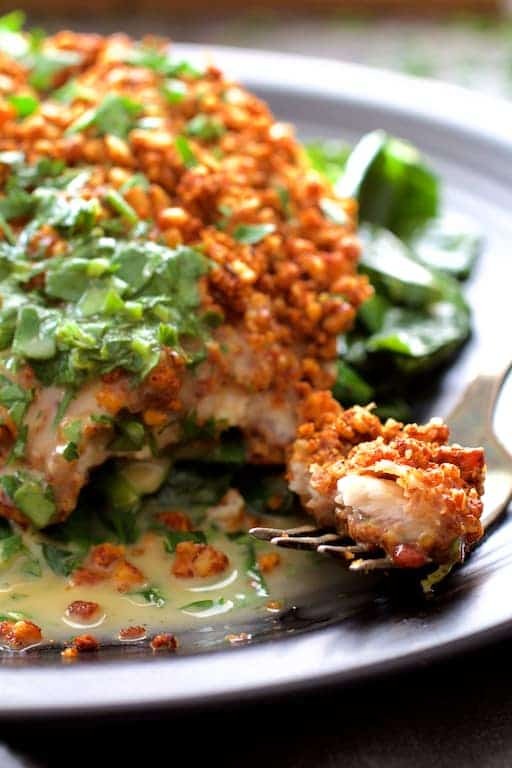 If you’re allergic to fish, try this preparation with chicken. Palace Cafe serves a decadent butter and cream sauce with their dish. To make my version healthier, I make a sauce using a light butter spread (such as Land O’Lakes). Light butter can’t take a lot of heat for regular cooking and doesn’t brown like regular butter, but it tastes fairly rich and melts smoothly. 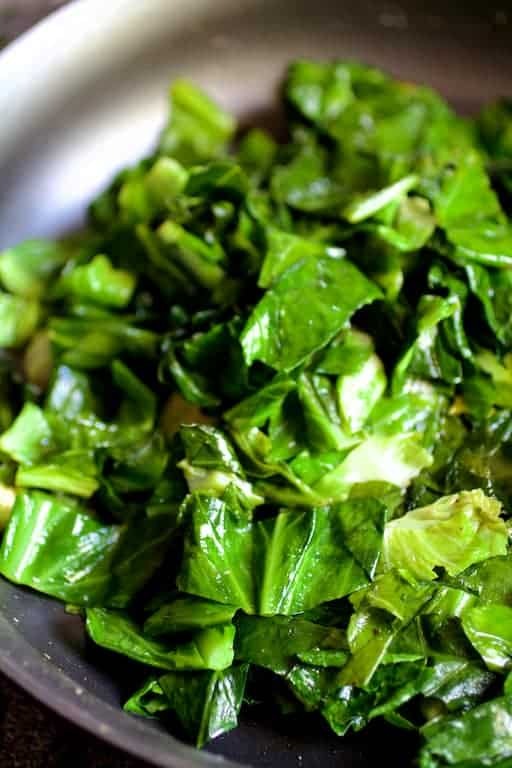 My Spicy Sauteed Greens make the perfect side dish. Use Swiss chard, kale, turnip, collards or spinach. After a quick saute, I jazz them up with fresh garlic, crushed red pepper flakes and a splash of red wine vinegar. 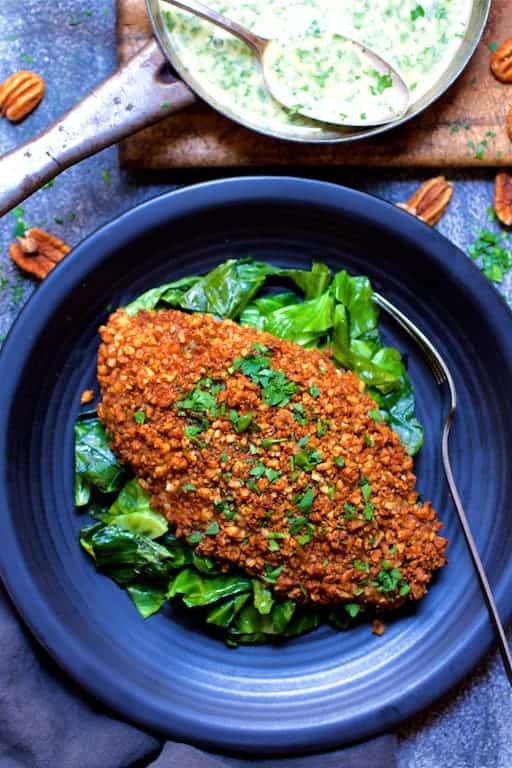 Baked Catfish Pecan Meuniere with Spicy Sauteed Greens! Laissez les bon temps rouler! 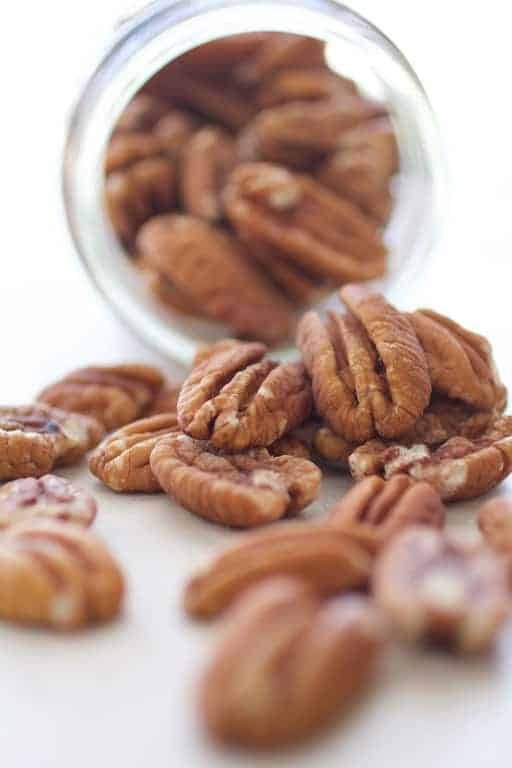 Thanks to Schermer Pecans for sending me the beautiful pecans I used in this recipe! CATFISH: Preheat oven to 375 degrees. Spray a baking sheet with cooking spray. SAUCE: Combine light butter, lemon juice, Worcestershire and hot sauce in a small saucepan. Heat over low heat until butter is melted. Stir in parsley. GREENS: Heat oil in a skillet or saute pan over medium-high heat. Add the greens in large handfuls. Use tongs to toss the greens around, adding more fresh green ones as the ones in the pan wilt. Wow- so yummy! Absolutely beautiful pictures!! Your food always looks so perfect! I’m definately trying this one soon!! Thanks, Eileen! Hope you enjoy! As I was reading the recipe I was going to ask about substituting the catfish for another fish. I swear that’s about the only fish I really don’t care for. To me, it just tastes muddy. The recipe sounds fantastic. Hubby should be catching some flounder soon so that’s what I’ll use for the fish. Hope you and your house are back to normal. Have a great week. Thanks, Marisa! Absolutely use another fish. I’m funny about catfish too, but I’m okay with U. S. farm-raised. It doesn’t have that “muddy” flavor. 🙂 Hope you enjoy!